Maison de bain spacieuse et moderne de 3 chambres à coucher et 2 salles de bain dans la belle région de Mission Lakes, située au sein de la communauté des parcours de golf. Piscine tranquille et privée avec terrasse et espace vert. Les installations comprennent une table de ping-pong, barbecue à gaz, Wi-Fi, laveuse et sécheuse, télévision par satellite. Évasion ensoleillée avec accès au golf et accès facile au centre-ville de Palm Springs et au centre commercial Outlet Cabazon, qui compte plus de 1 000 magasins. Nombreuses réserves de randonnées (oasis dans le désert, Big Morongo, White Water, etc.). Le parc national à couper le souffle, Joshua Tree, se trouve à une demi-heure de route de la maison. We stayed 2 weeks in the villa and we really appreciated it. This villa is very confortable and has everything you need. The owners are very kind and always available to answer our questions. All facilities are nearby at 5 mn drive. The neighborhood is very quiet and the private swimming pool is just superb. The family has also appreciated the table ping-pong. We recommand to visit Joshua's Tree National Park that is not far away (~30 mn drive). Moreover, LA and San Diego are not far way (2h~2h30 drive), making Desert hot springs a good spot. We definitively recommend this villa ! La villa est vraiment superbe avec tout le confort nécessaire et sans vis à vis. Le quartier est agréable et calme et on peut faire ses courses à 10 mn en voiture. Grande piscine. Nous avons passé une semaine très agréable à 4 (2 adultes et 2 ados). This property was very clean and well stocked with all the comforts of home. Very private and quiet back yard. Pool was refreshing, but we couldn't get the heater to heat water above 78 degrees. We would definitely stay here again! The place was peaceful and well equipped. Donald was great! We will be back! 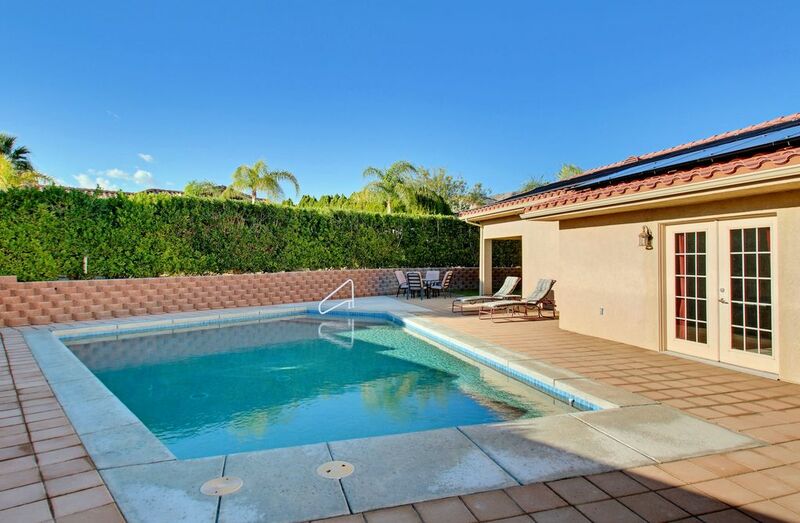 Beautiful House - Desert Hot Spring in close proximity to Palm Springs area. This house was very spacious with three large bedrooms and a bonus room with a pool table and a small twin bed in it. The kitchen was well equipped with all the plates. silverware, spatulas, spices, toaster, blender, and everything that you could possibly need to make a meal. There were plenty of towels and linens. The pool was wonderful. My grandchildren and children had so much fun in it. The barbecue grill came in handy for evening meals. When I travel back to this area, I will definitely stay at this house again. The owner was very responsive and we had no problems with the house at all. I would recommend staying here to anyone who is traveling to the area. - 10 minutes de restaurants, boutiques, casino et de divertissement du centre-ville de Palm Springs. - Facile à conduire les zones de randonnée naturels dont le parc national de Joshua Tree. Nightly Rate:Sun, Mon,Tues Wed - $150.00 Thurs, Fri, Sat - $160.00 Weekly Rate: $900.00 Note - regarding cancellation, I have many inquiries, if you secure the rental with a deposit I follow the cancellation policy ( box above, Payment terms) no exceptions Monthly Rate: $2700 Non-Smokers Please. Rental Rates: * $150.00 Per Night (Thurs, Fri, Sat,$160.00 ) + 10% Tax, and $105 Cleaning fee * $900.00, 1 Week - + 10% Tax, and $105 Cleaning fee * $1350, 2 Weeks - + 10% Tax, and $105 Cleaning fee * $1750, 3 Weeks - + 10% Tax, and $105 Cleaning fee * $2700, 1 Month - $105 Cleaning fee __________ * 10% Accommodation Tax, for stays under 28 days * 25% booking deposit, balance due 30 days prior to stay * Cancellation (no refund - re-bookings only).